Daniel Kaluuya stars as Chris in this modern, horror themed take on Guess Who's Coming to Dinner but the film goes way deeper than that. 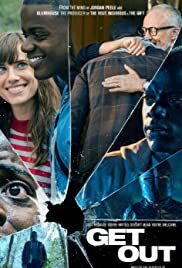 Written and Directed by Jordan Peele of Key and Peele fame the film is not without its humorous moments, but the underlying fears of people, in general, are addressed in this film. It's a lot deeper and bigger than race more about addressing the many small fears adults have. There is a scene in Get Out where the protagonist is asked to explain "the African American experience." This film feels like something Stephen King would have created had he be able to answer that question. Lucky for fans seeing the psychological thriller, they get a nice dose of the answer along with some cultural self-reflection for all audiences. There is also some comedic elements in the film that help give fans a breather before scenes of discomfort play. That is not to say the film is overly gory, but relatable discomfort in social situations many can relate to. Meeting the parents of someone new in your life, cultural and racial differences, and a general "fish out of water" feeling is present as soon as the film gets going. It really does make you think about a lot once the film closes. Trusting someone in a new relationship, and the risk of that being fractured without a moments notice is scary enough let alone trying to get to know the family of someone from a different background. Get Out is rated 'R' for violence and out now, catch this one soon...and especially if you just started seeing someone where it seems too good to be true.